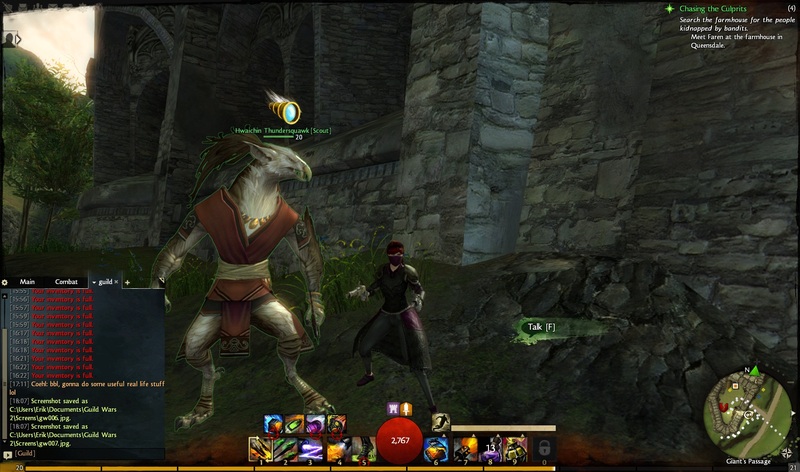 I had a ton of fun playing Guild Wars 2 this past weekend. Going into the beta I, like many players, had a plan; I would play an engineer and a guardian focusing primarily on crafting as gold and material permitted. Amazingly here on the other side of the weekend I actually managed to stick to the plan. My guardian was a Norn Male named Ag Mund as Agmund was blocked by the offensive name filter(If anyone know why please tell me in the comments). The engineer was a human female named Miriam Symata who ended up being my main. I also rolled a ranger an Elementalist and a necromancer. While I was planning on avoiding playing necromancer at all this weekend the siren song of minions and death shroud was too sweet to ignore. That said I only played the necro to level 4 (about an hour) at which point I realized if I didn’t stop immediately I wouldn’t get back to my engineer. I also only played the guardian to level 6, but it became clear that in order to explore the most content I would need to focus on a single character. I spent no time in any form of PvP this weekend and I was only able to explore two thirds of the PvE areas. While I enjoyed myself greatly across the board I would like to highlight some standout moments. The first really exciting event occurred at level 2 when I decided to pick on something bigger then myself. I went and attacked several level 5 drakes and using circle strafing was able to kill several of them one on one. I was using dual pistols on my engineer which from what I saw had the highest damage potential of any of the engineer weapon combo. After killing several drakes I continued on to an area with level 7 bears and level 6 “neutral” stags. I pulled a bear and began circle strafing only to discover that the number three skill on my pistol bounced to neutral mobs. Now I was being chased by three enemies who could very nearly one-shot me. I then discovered that there are AI factions and that bears don’t like stags and vice versa. The stags had the ability to charge, but when they used it they ended up hitting the bear instead. The bear was rather perturbed by this and turned on the stags buying me a moment to gain distance and heal. Returning to the fray my damage output pulled the warring animals off each other and towards me. I resumed circle strafing and after a tense minute or two managed to take them down. After wandering about getting into fights way over my head I began to feel somewhat bored/frustrated with my progress. I know me bored in a game I have been anticipating for five years how did this happen. Well the opening area for humans is lousy with heart quests. There are quite a few of them and while they are interesting I was hoping for more dynamic events. Fortunately my momentary blahs were remedied by Aneksi from Relics of Orr who shot me a guild invite. I have to give a shout out to the good people of Relics of Orr [RO] and Hunter from hunter’s insight. The vast majority of my time in beta was spent with them and they added an immeasurable amount of camaraderie and fun to the experience I will definitely be joining RO at launch. One especially enjoyable bit of adventuring for me was when Spirit(Anohikari) led us into a jumping puzzle in the Charr starter area. We spent an hour or two getting torn up by traps, falls, flames and shadow skelk. While Spirit drifted through the death trap with the ease of her namesake the rest of us stripped out of our armor to avoid the repair bill. I ended up with fewer deaths and falls than my compatriots not due to skill but because I was exploiting the daylights out of the engineer’s Jump Shot. The puzzle was fantastic both in design and atmosphere. Speaking of design and atmosphere holy smokes, Guild Wars 2 has those in spades. One thing that fades into the background of GW2 is that when you go exploring everything is custom. Unlike other games that reuse the same cave over and over ANet opted to build each subterranean area individually. That is huge to me. Every time I find a new hole in the ground or underwater I don’t know what to expect. Will I find a giant cavern full of dredge or a lava tube teeming with destroyers? This customization is part of what makes Guild Wars 2 an explorer’s paradise. If you need an example of GW2’s explorer love, look no further than Lions Arch. From the sandy mini-pet arena to a pub built into the highest arch, Lions arch is one of the most interesting cities I have had the pleasure of exploring in a MMO. My first real taste of the city came when I mistakenly insisted to Aneksi and Coehl that you could get to Kessex Hills by way of lions arch. As we made our futile journey through the city we stopped to inspect a Kodan then met a pirate captain that looked like a very tall fifteen year old girl and dove off a twenty story diving board into the bay. After a half hour or so we decided to fast travel to divinities reach and run to Kessex Hills, by then we had seen only half of the city. I discover a potential arena for Polymock! There are just a few of the stories I’ve taken away from the Guild Wars 2 beta. I’m very much looking forward to making more stories in the coming betas and release. How about you fair readers? Share a story in the comments below! 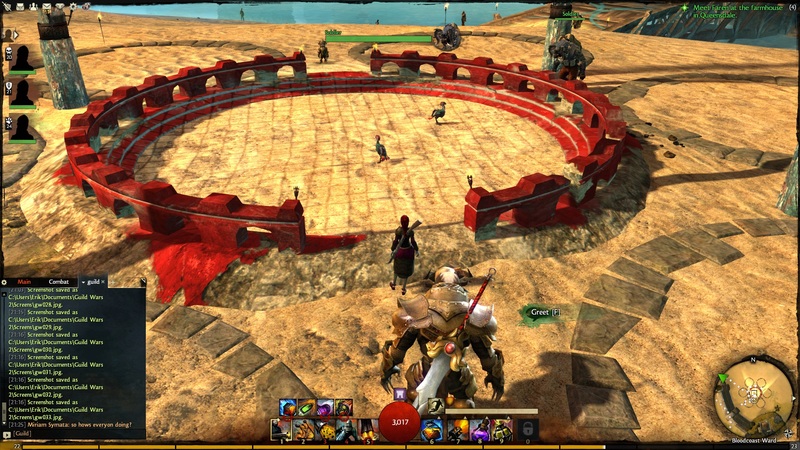 This entry was posted in Guild Wars 2, Reviews and Opinions. Bookmark the permalink.